From the 2013 Celebrating Excellence | The Malone-Hood Plaza on The University of Alabama campus is a peaceful space between Foster Auditorium and Farrah Hall where students relax and visit between classes. In its center is the Autherine Lucy Foster Clock Tower. 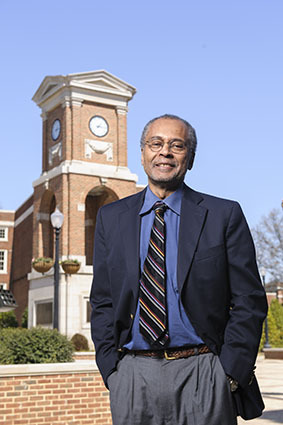 Just steps away in Farrah Hall, Dr. Bobby Wilson, professor of geography, has conducted research for several decades that is intimately tied to the work of the plaza’s namesakes, Autherine Lucy Foster, James Hood, and Vivian Malone Jones, the first three African Americans to enroll in The University of Alabama. Wilson’s proximity to the plaza is fitting. Throughout his career, he has applied his work in geography to look at and change issues of social and racial inequality. That research earned him the Presidential Achievement Award from the Association of American Geographers, the predominant national scholarly organization in geography, in April. Wilson grew up on a farm in rural Warrenton, North Carolina, where his grandfather and father grew tobacco, cotton, and cucumber crops. When his father took a job working in a textile mill, Wilson took the responsibilities of tending to the crops. His responsibilities on the farm shaped his character and strengthened his relationship with his grandfather, a pivotal figure in his life. Wilson was in high school in the early 1960s when the Civil Rights Movement swept the country. As national attention was focused on the racial violence in Birmingham and elsewhere, Wilson experienced the struggle for civil rights in his own backyard. Community members staged sit-ins at the local drug store, where the young Wilson was arrested for demonstrating alongside his grandfather, who was very active in the movement. Wilson recalls his grandfather riding up in his truck to pick up all his grandchildren to go demonstrate. Wilson became the first person in his family to attend college. He attended North Carolina Central College (now University) in nearby Durham, North Carolina. Although only 45 miles away from his home, Wilson said it felt like a world away from the farm. He had planned to major in mathematics, but soon realized his interest couldn’t overcome his lack of a solid foundation in the discipline. Wilson attributes this to his education at a segregated black high school, where the academic offerings were not up to par with white schools. Wilson switched to geography. At the time, North Carolina Central College was one of the few historically black colleges that offered an undergraduate degree in geography. Dr. Theodore Speigner, head of the geography department, took Wilson under his wing. Wilson earned a graduate fellowship to attend Clark University, one of the top five geography programs in the country at the time. This coincided with a large push from the American Association of Geographers to recruit more minorities into the discipline. Racial zoning ignited many of the civil rights-related outbursts in Birmingham, Wilson explained. Many people remember the bombing of the 16th Street Baptist Church, but many more bombings occurred when a black person tried to move into a white neighborhood. Center Street, near Legion Field, was the dividing line that separated black and white communities, and it was also the site of Dynamite Hill, so named for the numerous bombings of the homes of black leaders. Wilson turned his scholarly eye on Birmingham. While a hotbed of racial tension and civil rights activism, it was also the largest industrial city in the South at the time. Through his research, he found that there was a historic connection between race relations in the city and the thriving industrial capitalism. He found that many of Birmingham’s early industrialists were plantation owners before they ventured into the coal, iron and steel industries after the Civil War. Wilson said they brought their slave-era attitudes about the labor force with them, and this laid the foundation for the extreme racial divisions that culminated in Birmingham’s civil strife. These ideas were the basis of his first book, America’s Johannesburg: Industrialization and Racial Transformation in Birmingham. Wilson followed this volume with Race and Place in Birmingham: The Civil Rights and Neighborhood Movements in 2000. Wilson’s area of specialization, once known as radical geography and now called critical geography, uses aspects of geography to look at issues of social and racial inequality. Critical geography critiques capitalism to better understand forces of social and economic inequality. While his research into issues of housing, urban revitalization, economic development, and social justice for black communities earned him recognition from the AAG, Wilson knows there is still much to be done.